A palace of kings and a den of thieves. At the foot of Collserola stands one of master architect Antoni Gaudí's best-kept secrets: Bellesguard. A private residence built on medieval remains now open to the public, so visitors can share Gaudí's genius. Despite having some straight lines that have no part in the sinuous curves of Gaudiesque architecture, there is no doubting that Bellesguard House is one of the best examples of architectural innovation by the master architect Antoni Gaudí. Jaume Figueres, a businessman and close friend of Gaudí's, wanted to build a house for his family in a unique setting with lots of political significance. 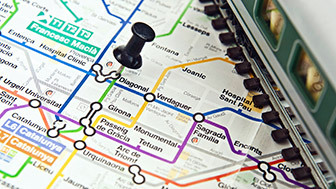 So he chose a place in Collserola, where there were the remains of a medieval castle that belonged to King Martín the Humane but which, in the 18th century, was home to the highwayman Serrallonga. Gaudí, impressed by the history of this spot, designed a house inspired by the old castle with some very straight lines, and he made the most of the remains to design the garden of the estate. The result is an impressive mansion that resembles a castle with its merlons but has a lot of Gaudiesque touches, such as the use of wrought iron, ceramic mosaic benches, large, colourful glazed windows and brick friezes, as well as a detail that does not escape the curious eye of visitors: the ivy-shaped pipes. Bellesguard, declared a Property of Cultural Interest in 1969, is now open for guided tours, so you can enjoy the majesty of its rooms, the tranquility of its gardens and the spectacular views but, above all, so you can admire close up, one of Gaudí's treasures, perhaps the one most hidden from view. 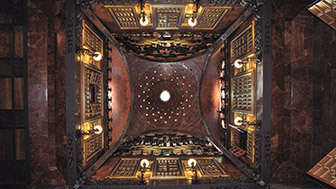 The Palau Güell launched Antoni Gaudí's career as a prestigious architect. 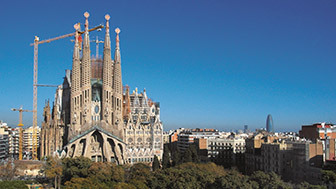 The Sagrada Família is one of the best symbols of Barcelona.